Fox News: Were Christians Tortured in a Cairo Mosque? 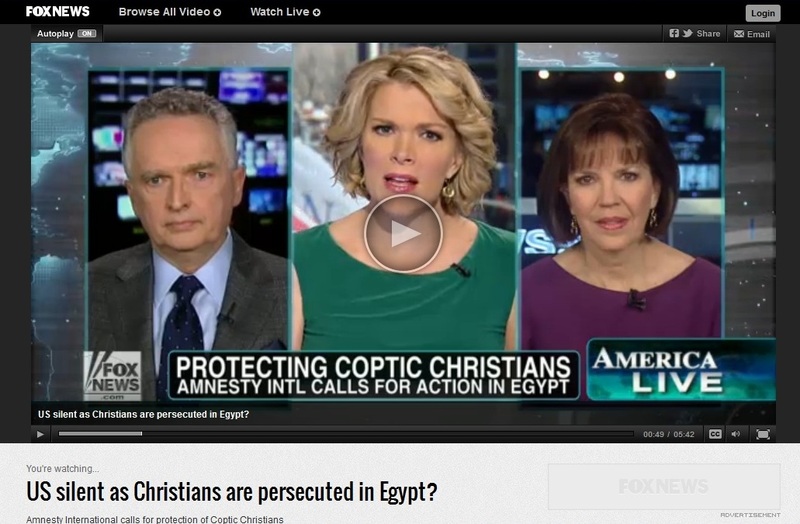 On March 28, 2013 Fox News broadcast an incendiary video report entitled, ‘US Silent as Christians are Persecuted in Egypt?’ It is understood that media relies on a level of sensationalism in order to attract the viewer or reader to a story. Yet this report moves beyond sensationalism to distortion, in which elements of truth are stretched to create an impression far removed from reality. I watched this report after friends and family brought it to my attention. I’m sorry to say it made my blood boil. Several months ago I published a report on AWR examining if the Muslim Brotherhood was crucifying its opponents, but this alleged incident was reported only by fringe and internet-based sources. Here, we’re talking Fox News! Certainly it is known that the station has a conservative bent, but this video makes it seem as if they are pushing an agenda. Egyptian news coverage is generally of poor quality, un-sourced, and designed to shape opinion rather than inform. Here, Fox News does its best impression. I have heard similar descriptions of US stations MSNBC, and to a lesser degree, CNN, only from the liberal side. I am fearful the American public has entered an era in which news is meant to entertain and confirm opinions, rather than to educate and challenge them. I am also dreading this aspect of being back in America for an upcoming visit. If news is not able to be confirmed by a reputable news agency, it should not be repeated, and certainly not the lead story. At least they mention this detail up front. Mideast Christian News did not report about a torture chamber for Christians, however, as best I could research following their newsfeed. On March 23 they ran an article featuring testimony from Amir Ayad, a Coptic activist. He related how he was ambushed by the Muslim Brotherhood during the clashes and tortured in a mosque in Muqattam. Muqattam is the suburban Cairo neighborhood mentioned by Fox News. It hosts the headquarters of the Muslim Brotherhood and as such was the site of an anti-Brotherhood protest. The administration of the mosque in question publically confirmed that Islamist activists took over the facilities and turned it into a detention center. A similar incident took place during the clashes at the presidential palace in protest of President Mursī’s declaration immunizing his decisions from judicial review during the controversy over the drafting of Egypt’s constitution. Muslim Brotherhood members attacked a small but peaceful sit-in at the palace, which led into large-scale confrontations between the two sides. During the clashes the Muslim Brotherhood also created detention centers in adjacent facilities, though not in a mosque. Details and testimony about what happened at both events is contradictory, but it appears likely the Brotherhood or supporting Islamists assumed police-like prerogative to apprehend protestors – perhaps rioters – on the opposing side. Furthermore, there is no reason to dismiss the testimony of Ayad that he was tortured; the article includes a picture of him in the hospital suffering from multiple wounds. The protest at the Brotherhood headquarters, however, was not a Christian protest, it was political. Ayad, as a Christian, was detained, perhaps along with other Christian protesters. The great majority of protestors, and therefore detainees, however, were Muslim, consistent with the makeup of Egyptian society. For Fox News to report this incident as a mosque transformed into a torture center for Christians – with none of the context of these recent clashes – is an egregious distortion of a story terrible in its own right. It is fair to ask what Miller believes is the difference between a second- and third-class citizen. Clearly this is only a rhetorical device. But it is in service either of wanton ignorance or clear distortion. There is no ‘Christian quarter’ in Egypt or any of its cities. Christians are spread everywhere throughout the country. Perhaps he was referring to the district of Shubra in Cairo, which has a large percentage of Coptic residents. Shubra is a lower- to lower-middle-class neighborhood, but it is hardly a slum. If it is, it is equally populated by Christians and Muslims together. Or perhaps he had in mind Heliopolis, which also has a large percentage of Coptic residents, but is one of the wealthier districts of the city. In either case, these areas are characterized by the best relations between Muslims and Christians, as they grew up together in an integrated community. They are far from second-class citizens. They are neighbors. Please click here to watch the original video, and here to read the rest of my point-by-enraged-point rebuttal (and occasional agreement). Why couldn’t they confirm the report? They do have name names of specific, identified individuals who were present at the scene, and the report was very specific as to what occurred, where it occurred,when it occurred, who did it, why it was done, what instrument was used, the name of the victim and the identity of who stopped it from continuing. What kind of reporters can’t confirm a story with all that information? A good detective finds answers to the questions who, what, where, when, why and how. Are they incompetent or is the news being manipulated in Egypt? This story should be a slam-dunk to confirm. Fox News happens to have the largest audience and get all the awards for excellence in reporting, regardless of what the writer alleges. CNN and MSNBC DO manipulate news by not broadcasting events that put the Obama administration and the liberal agenda in generar, in a less than stellar light. Maybe that’s why their audience is waning.